Polish regulatory authorities will be reducing leverage to a maximum of 1:25. Polish regulatory authorities have taken further aim at foreign exchange (FX) regulations, introducing new legislation to reduce leverage to a maximum of 1:25 as well a broader mandate to publicly alert investors to any unauthorized activity. The efforts reflect Poland’s increased emphasis on protecting clients and placing its regulations on par with other countries. Polish regulators have also begun to wield more power, facilitating harsher penalties on unlicensed entities. 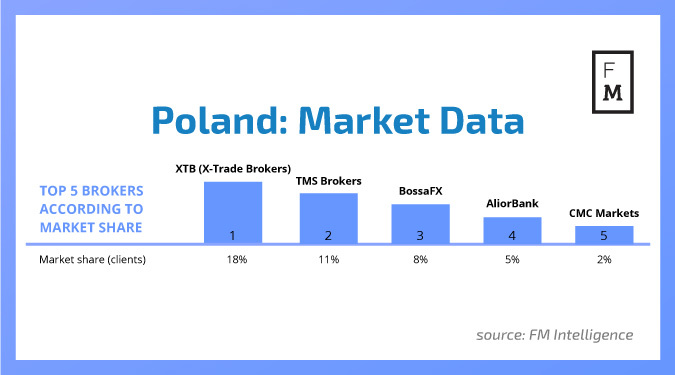 In its latest bid to shore up the FX market, the Polish Financial Supervision Commission (KNF) is altering the maximum leverage available for retail clients. Previously the maximum leverage was pegged at 1:100 with a margin of 1 percent – the new regulations will impose a maximum leverage of 1:25 with a margin of 4 percent. In addition, the KNF will install a new mechanism for external judicial control which will allow the regulator to liaise with other telecommunications services providers (internet, phone, etc.) to obtain any pertinent information regarding unlicensed brokers (names, phones, addresses, etc.). The KNF will also gain new powers regarding alerting investors and Polish clients of potential scams. The regulator will be entitled to include the names of firms in a publicized domain list, even if no notice of a suspected crime has been released, as long as the operations in question are targeting Polish clients. This ability will aid the KNF to maintain its jurisdiction domestically. The latest measures constitute the Polish regulator’s widening legal mandate to police the domestic FX and financial services industry. Earlier this year, the KNF implemented new measures to curtail access to the market for unauthorized forex brokers. The watchdog has since been empowered to regularly update and maintain a list of unregulated companies that are targeting Polish clients, and ban their access to the market via internet service providers. The Polish authority also augmented its power to fine companies that are providing financial services in the country unlawfully. Previously the KNF was able to levy penalties of up to PLN 5 million ($1.35 million), and it has since proposed a doubling of the maximum fine. Indeed, multiple EU countries have been the target of unauthorized brokerages for several years now, with no shortage of tactics deployed against a vulnerable customer base. Polish regulatory authorities have taken notice of this trend and have opted to bolster the measures available against such activities. Poland represents one of the first instances in the EU of a regulator actively engaging in traffic filtering from such unregulated websites to protect retail clients in the country. Nie dobzre!!!! however it will be interesting to see ESMA’s new EU-wide rules and whether country’s like Belgium/ Poland and France will be able to bypass those laws.. Hopefully they won’t be able to as ESMA will provide enough guidance to give them confidence in supervising this sector.